Last week I wrote about cucumbers and the insane amount we harvested throughout May. Oh, they still sent May off with a bang, giving us a reusable grocery bag full in the last two days of May. I’m beginning to run out of counter space. This isn’t a new thing, I’ve dealt with this before in Florida and our harvest there, but we had more counter space then. I’ve been picking them when they just turn pink on the bottom (unless I miss one and get one that is ripe), to keep the bugs and birds at bay. 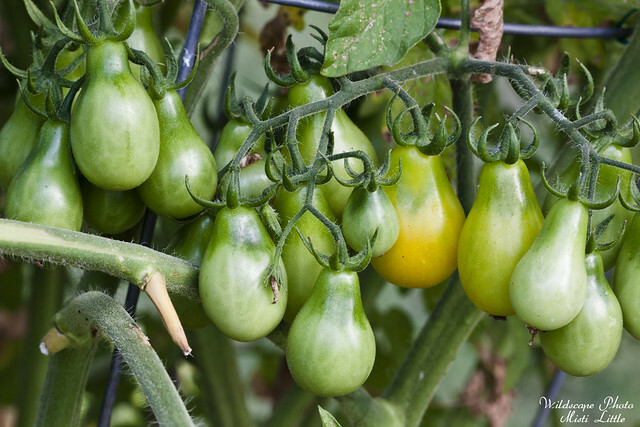 I’ve seen many birds flying into the tomatoes when I’m in the garden but haven’t seen them pecking at them yet. A view of the back two beds. There’s also a third bed you can’t see from here. Very much a jungle! 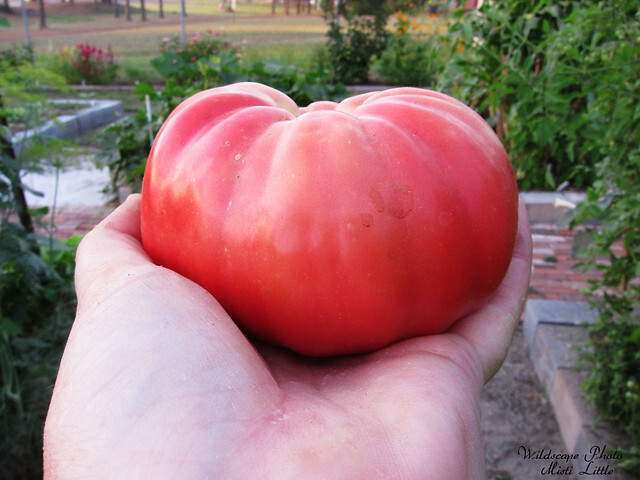 An Arkansas Traveler tomato—my favorite. I sliced this one up and enjoyed it before dinner the other night…mmm! Some of the Early Girls. I haven’t been too impressed with their flavor but I have been impressed with their abundance and their ability to not really have any pests. I would probably grow them again if I didn’t know they were owned by Monsanto. The Yellow Pears have been producing well and staying consistent but they have been out-competed by the Sungolds in prolific-ness. 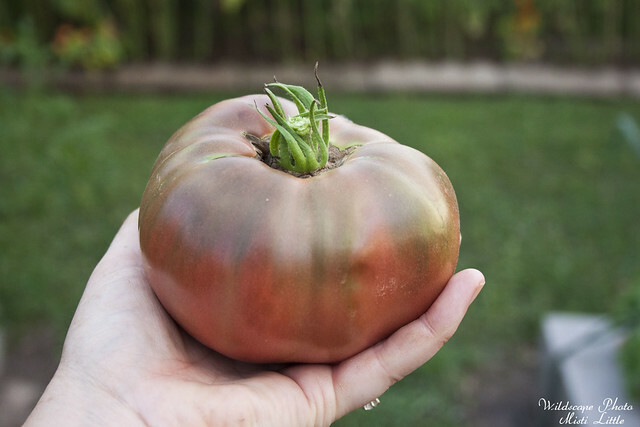 I’ve also been impressed with the size of the Cherokee Purples, mostly because the first few I had were on the smaller side but they continue to get larger as time goes on. I would grow them again, they seem to handle the pests and heat well so far. The Sungolds in their insane, branching glory. 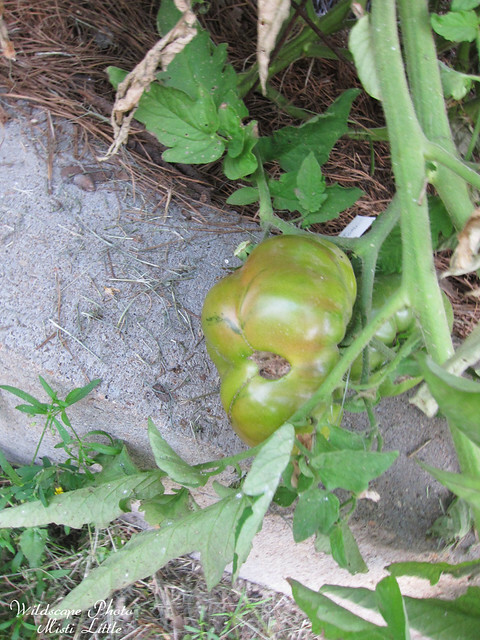 They’ve managed to find a way to vine through the other tomatoes and I can’t keep up with them. 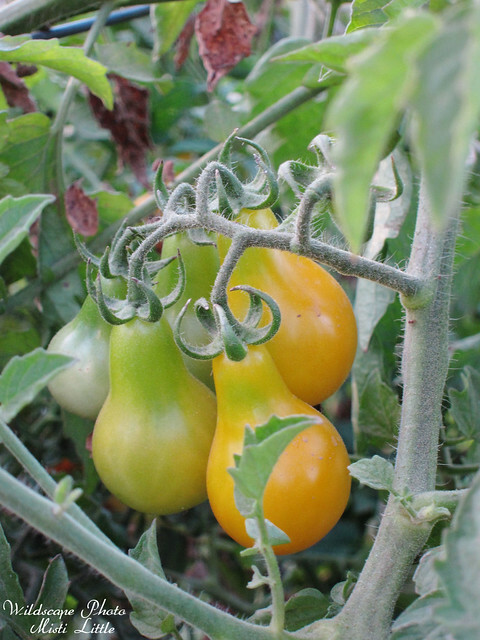 I will be looking underneath a tomato two spots over and find Sungolds hanging out there. Amazon Chocolate is a favorite of Chris’ and they are starting to come in heavily. They are also noted for their size. So, with all of these tomatoes I’ve been trying to keep with preserving them in some fashion. One night I made tomato jam which turned out much better than I was expecting. I probably could have boiled it down another half hour but it was already 10:30 pm and I still had 20 minutes of hot water bath to go (that didn’t include the time it took to get the canner up to boiling speed—add about 20-30 minutes for that! ); needless to say preserving and canning food is time consuming. I made 12 pints of salsa and then blanched enough tomatoes to make two separate batches of whole, peeled tomatoes for use in stews and other things later on. That resulted in 12 quarts. 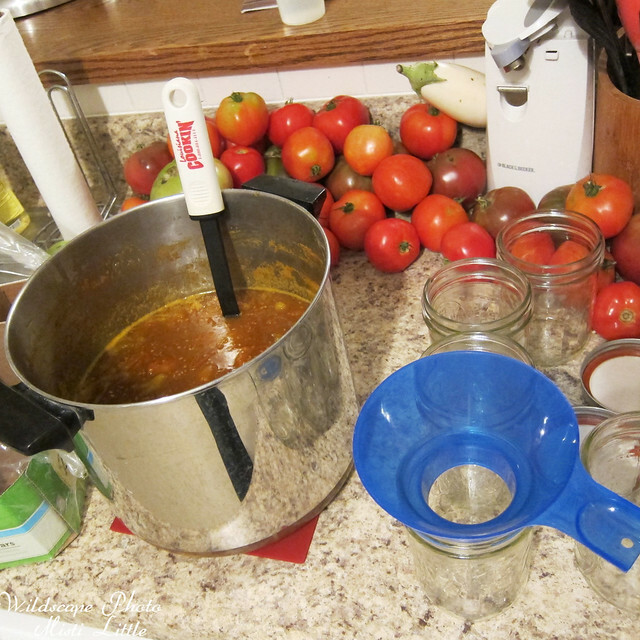 I will probably make another 6 quarts if not another 12 at the rate we’re going on tomato abundance. 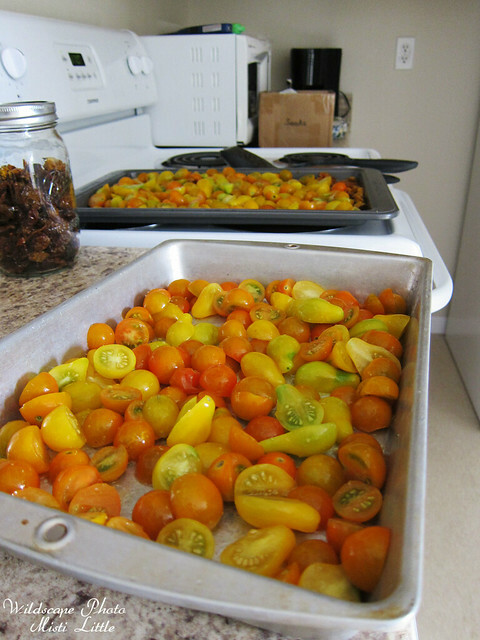 I took to drying the smaller tomatoes in the oven; you can see some of the results in the jar on the left side of the photo. This is time consuming but mostly hands off because you let the oven do the work. 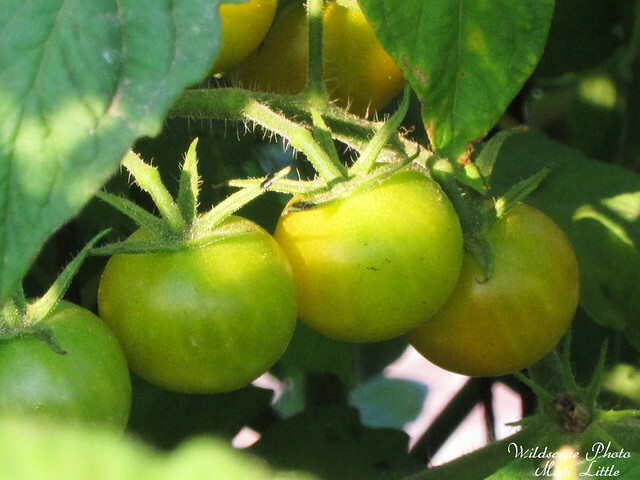 I love having the tomatoes and I know that all of this work now will be well worth it in the fall and winter when I am dreaming of tomato season again! Also, if you haven’t been by Sprout Dispatch, a collaborative blog featuring me, Curtis (my brother), and Chel, drop by and say hi. 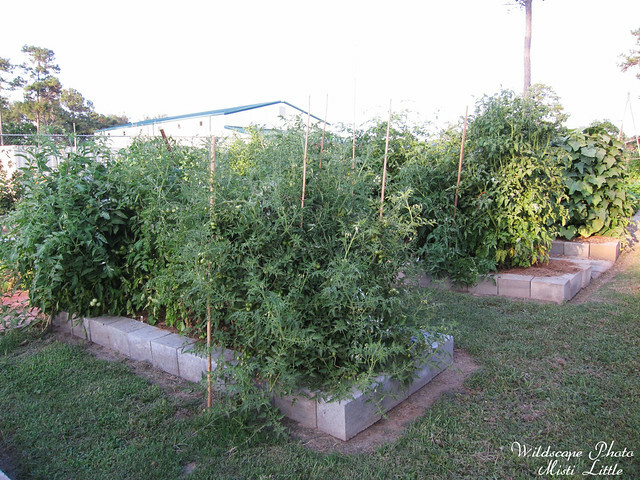 Today I am writing about saving tomato seeds! WOW! 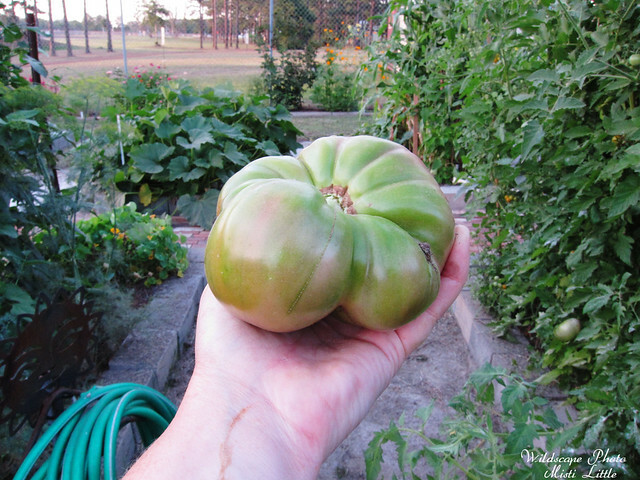 I just cut down our tomato plants (they gave us two years, so I figure it’s time to start new) and we got a giant bowl full but nothing like this! 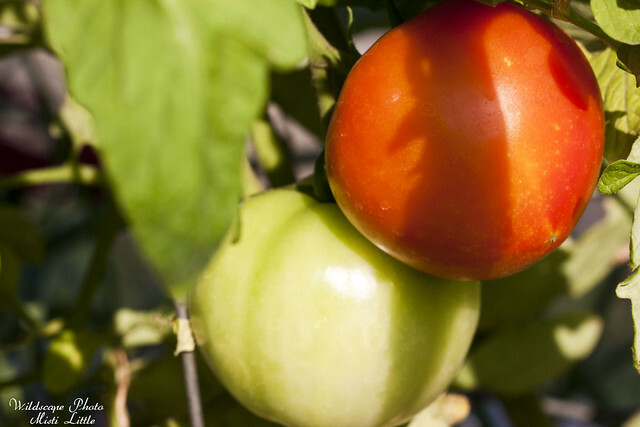 Now I’m looking for new tomato varieties for fall. Tom really loves Roma so I’m going to try a few different kinds and see what he likes best. 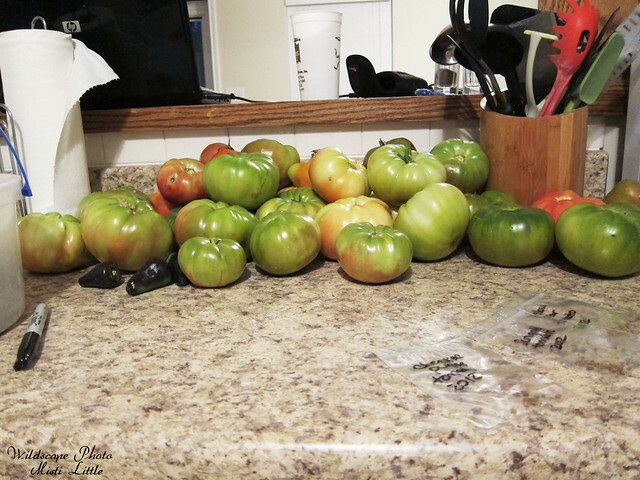 I only like tomatoes cooked (they squick me out raw, but they are so beautiful and I love their smell in the garden…) so he gets to pick. WOW! I am so impressed!!! I never got any tomatoes in the ground this year, but do have an abundance of raspberries coming in. 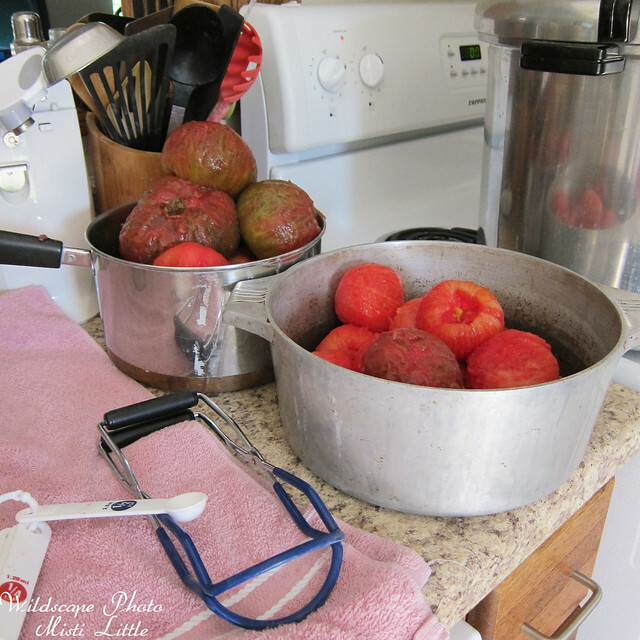 How about a lesson in canning? I’ve always wanted to try it, but have no idea what is needed and how to begin. @Joan: Salsa is really easy, just add more peppers to your taste! 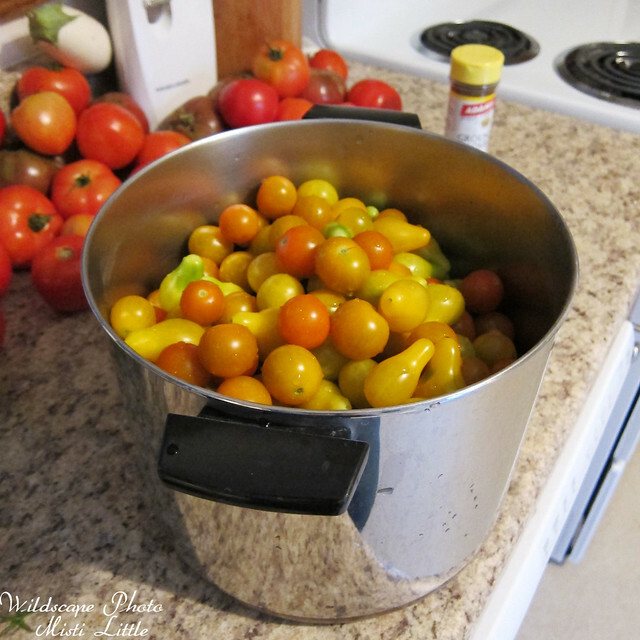 @Christine: Lesson in canning? HAHAHAH! There are much better resources, but maybe I will put together a resources post! That would be great! There are a lot of things I would like to try growing here, but don’t want to be swamped with more than we could eat before they go bad, so yeah…must learn how to can! I’m so glad you and your brother inherited your grandmothers green thumb and canning bug! It obviously skipped a generation with me. I’m looking at your tomatoes with equal amounts excitement, and an awareness of the work involved. Everything looks lovely!